Take a card with two slits and shine light on it; you will get stripes on the wall. T. Young says that we are watching "water waves in a pond" or sound waves, the same principle/truth he had just written up in this thesis. He got the Nobel prize for his discovery. Young's interference experiment, also called Young's double-slit interferometer (wikipedia). How would you draw light from a light bulb? The answer: like the water waves in a pond when you throw a small stone or tap with your finger. You would therefore draw them like radii or spheres as below. Now let us imagine that we have a card with two slits infront of the light bulb. How would you draw the light that is coming out from each one of those? As above, like water waves in a pond when you throw a small stone. We would draw the above pattern for each slit; each of them could be considered to represent a new light source. This is a sketch from T. Young, the scientist that discovered that light behaves like a wave. What will happen when the waves of the one source meet the waves of the other? How will they interact, or in other words, how will one "interfere" with the other? First of all, what are these waves? They are carriers of energy. Let us take the example of sea waves. Do sea waves move the sea gulls that sit on them? The answer is no! Sea waves do not push the sea gulls forward, just up and down. This means that water molecules are not transferred, just energy is transferred past the water molecules. What will happen when two waves reach the same point? Waves consist of ups and downs or crests and troughs. If two crests arrive on the same point, they get “added” and you will get a big wave. Generally, if waves are in phase, we have “constructive” intereference. If a crest and a trough arrive on the same point, you will get something flat (the addition here results in one being substracted from the other). Let us now go back to the light wave experiment. Let us try to follow the wave fronts that show us how light energy is transferred. When these "energetic lines" meet we have a lot of light energy. These will be the yellow dots. As we move away from the yellow dots energy is decreased until it becomes zero. Notice where the empty dots are. The furthest possible from yellow dots. If you follow the yellow and empty dots on the screen you will understand why we see stripes as an interference pattern. Einstein explains why and gets the Nobel prize for the photoelectric phenomenon in 1921. Macrocosm paradigm: Imagine some beach balls on a dock and either a small wave or a tsunami wave arriving at the dock. When will the balls fly off with more kinetic energy? Answer: Tsunami wave. So, higher amplitude wave means balls flying off with higher kinetic energy. Microcosm paradigm: Imagine some electrons in a metal, in the frame of an atom structure. If a wave of light hits them they can fly off. When will they fly off with more kinetic energy? If you provide “a lot of light”, in other words a very bright light, or a very weak one? Experiments shows: Same thing. So, light wave amplitude does not affect electron flying off kinetic energy. If a tsunami light wave and a tiny light wave have the same effect, that suggests that the wave notion for light has to be modified or maybe complemented in physics. So, how does the electron fly off the atom? It is a negative charge attracted by a positively charged nucleus. Opposites attract and the electric force (Coulomb force) keeps it in place. It is probably kicked off, knocked away. Some kind of collision and this collision gives it kinetic energy to fly off. Same kinetic energy in all cases? It must be the same kind of collision. What can collide with it and always give it the same energy? When providing light that is. A particle made of what? A particle made of light (φῶς =light, of the light=του φωτός - genitive case - its genus). A particle of light representing a light unit (das Lichtquant, as proposed by Einstein), for which the name “photon” was later adopted. Let us now put our theory to the test. Can it predict other experimental results? We examined amplitude, now let us examine frequency. Imagine you want to test the effect of the frequency of the wave. Frequency of a water wave is equivalent to how many waves arrive at the dock in the unit of time. What is the frequency of light about? Note: We usually refer to wavelength and we know for example that the visible spectrum is around 400-700nm. Below 400nm we have ultraviolet and above 700nm we have infrared. (Violet is at 400nm and red at 700nm). By consulting the chart we see that blue light has a higher frequency than greenlight. When will you get more electrons flying off? When you shine same amount of blue light or green light? In the first case you will have one blue photon colliding with the electron and in the second one green photon colliding with the electron. Answer: Same number of electrons will be flying off with either blue or green light (same amount). When will the electron fly off with higher kinetic energy? It depends on the energy of the photon that will collide with the electron. We could also use the following Hyperphysics site link and type in the "nm" box 400nm for blue and 550nm for green. We see that a blue photon of 400nm has an energy of 3.1eV and a green photon of 550nm an energy of 2.25eV. Therefore green photons are more energetic and provide more kinetic energy to electrons. However there is an important consideration! What if you shine red light on a metal like potassium? Nothing will happen. So, a red photon of 700nm or 1.77eV collides with an electron but cannot make it fly off. It appears that the energy provided is not enough to surpass the electric force. This notion is represented by the reference energy required to eject a photon and is called the work function. For potassium for instance it is 2.0eV. A red photon being equivalent to 1.77eV cannot eject the electron. 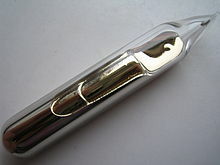 Here is a photo of caesium which has a similar work function to potassium.